It wasn’t all about food. It was about whatever we need to succeed in our task. When we build His house, He will build ours. The Lord spoke a clear word, “Come up higher—the feast of all you need is already waiting, but to reach it you must come up higher.” To come up higher—(and achieve our dreams here on earth)–we must go up higher in the Spirit. To go up higher…we must go up higher. Meaning to get to that next level—that place we attain in our heart and achieve the dream of our heart, we must be willing to go up higher in Him. He says, “Come,” but then we must go. He has said that we are seated with Him in heavenly places. (Eph 2:6) He has made a seat for us beside Him. When we are in heavenly places we have a different perspective. We can see from the top down—the entire view. Why is it that we climb down from that heavenly perspective and walk back into the earthly perspective? For when we do, we can only see what is in front of us or within our immediate limited view. This is about seeing with His eyes. It is about understanding that when we build His house, He will build ours. His invitation is to come up higher. It is an invitation that requires us to leave more of us behind and receive more of Him. To walk closer with Him in prayer, in the Word, in hearing His voice—which only comes as we spend time at His feet. It is a call to lay down our time, our desires, our rights, to go up higher. There is no shortcut. We are in a new season. It’s not something coming in the future, we are there. We are in the place of the prophesied transfer of wealth–in the Promise Land. But it’s possible to be in the Promise Land and still not partake of its fruit. Think of the ten spies. Those who carried out the cluster of grapes so big it took two to carry the load—and yet they never fully partook of the blessing. 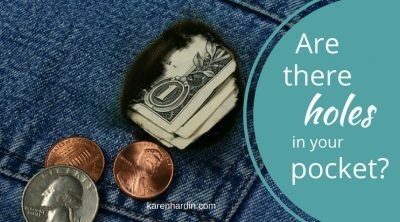 I have heard a word over and over in my spirit the last several weeks which was, “your pockets have holes.” What does that mean? This is about perspective. It is a call to come up higher. To see as He sees and possess His heart. There are times we get so consumed with the vision from God in our heart building that house, that it overshadows the building of His house. It is just a fine line when we move so completely into accomplishing the vision He has placed in our heart—that it becomes THE vision and we are running more for it rather than for Him. If that resonates in your heart it is time to sew up the pockets with holes. This is also a time for valor. For as you go up higher, there will be the fight to keep you where you are. great courage in the face of danger, especially in battle. strength of mind or spirit that enables a person to encounter danger with firmness : personal bravery. We are in a battle, and many have become weary because there have been holes in our pockets. If you have experienced that, then go back to that heavenly seat and see from His perspective. Are we building His house still or have we somehow shifted to building our house? Right now he is imparting a new courage and strength. He is strengthening arms that have grown weary and instilling personal bravery that drives out fear that has tried to take root in your heart. Take hold oh mighty one of valor. Gideon was called a man of valor, before he ever stepped into that mantle. Step into that place as God sees you, where He has called you. 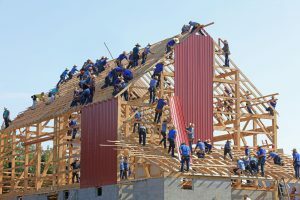 Step into the courage and valor of this season and build His house and as you do, He will enable you to build yours.